After the worst New England winter in years, our local roads seem to have more potholes than ever. While small potholes are just annoying and uncomfortable to drive over, larger ones can not only damage your car, they can cause accidents. The greatest danger, though, is to motorcycles. A motorcyclist who hits a pothole is far more likely to lose control of his vehicle and fall or skid into an obstacle or into the path of an oncoming car, leading to serious injury or death. 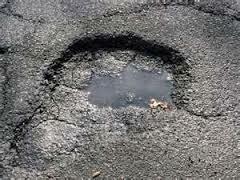 Even a road that appears well maintained can have a pothole in a spot where frost and water have gotten to work. Protect yourself, your car and other travelers from accidents by always watching the road and the cars ahead, both in your lane and in lanes on either side. Be prepared to slow down if you see vehicles swerving to avoid an obstacle you can’t see, or pavement that may be broken, or puddles that may hide potholes. Keep your tires properly inflated. Properly inflated tires hold up better against potholes than tires with too little or too much air. A tire can pop if the wheel rim pinches against the jagged edge. Beware of puddles. Puddles can be deceiving. They may look shallow but underneath the water could be a deep, sharp-edged pothole filled with water. Reduce your speed. If you can’t avoid a pothole, slow down before you hit it. Slower pothole hits generally result in less damage. Brake lightly. Slamming on your brakes and braking can cause greater tire damage. Don’t swerve. Your vehicle could hit at an odd angle, causing more damage to the tire, wheel rim and alignment. Don’t lose control. Hold your steering wheel firmly when driving over a pothole to avoid losing control. If you are injured in an accident caused by a pothole, call us for a free consultation. Our car accident lawyers can help you get the compensation you deserve.